A safe and secure table top to use your sewing machines is a priority for any sewing space! Every space is different. Using the space to it's fullest and keeping your building expenses under control can be a challenge. Follow my adventure in building a sewing table or desk that meets my needs. Your largest investment in sewing is usually your sewing machines so you want to make sure those machines are on a stable and secure location that does not bounce around when you speed sew. Years ago a sewing machine was the only machine you needed to consider. Now you may have a separate embroidery sewing machine and a separate serger. The amount of surface you need for these machines will be a variable in how you set up your counter space. My computer desk is 6 feet long. My sewing counter is a corner unit that is 6 foot on one edge and 8 feet on the longer edge. After I priced what new desk height cabinets would cost, without knowing Secrets to Finding Cheap Kitchen Cabinets, I scoured Goodwill and Salvation Army stores for used desks. Making two counters, I was prepared to not have the under cabinets match using used furniture. My luck changed when I found a yard sale that had four matching used motel desks for $20 each. These desks had a set of drawers on one end and legs on the other end. Although I could utilize the legs for supporting the counter top, I know my storage needs always exceed my storage space and bought all four to have four sets of drawers. My computer desk will meet most sewing machine needs. It required two drawer units, a six foot counter top, and three strong L brackets. I recommend testing the fit of the desk parts under the counter top before you disassemble the desk. It may be necessary to cut the desk top and leave it attached to the drawer unit in order to open the drawers. In our case we were able to disassemble the desk. The top of the desk came off by removing screws from the frame under the desk top. We did have to remove the top of the drawer backing and cut it to the height of the drawers. This cut easily with a razor knife. We placed the drawer units under the ends of the counter top, bringing the front of the drawer units to the front under the lip of the counter top. 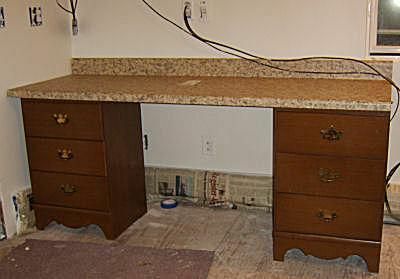 Bringing the drawers to the ends of the counter top provided total stability for the counter top, even if a heavy machine is placed on one end. Once the floor is in place we will attach the drawer units to the counter top using small L brackets and attach the counter top to the wall with L brackets for extra security. This is not finished but I couldn't resist testing the fit once the floor was laid. Even with just the drawer units under the counter top it is sturdy enough for a light weight machine. When it is finished I will be using the desk legs under the corner for support and drawer units under each end along with the same type of L brackets we are using on the straight desk. Use the wall space for upper cabinets and the underside of those cabinets for hanging things like scissors or other sewing tools so they are out of reach for small hands and where you can find them when you need them!